The Brazilian DIS investment fund has taken legal action against both Neymar and Barcelona, alleging it had been the victim of fraud and corruption over the Brazilian’s transfer to Spain. The Brazil international moved from Santos to the Catalan giants in 2013, but there appear to have been major discrepancies over the reported transfer fee. DIS owned 40 percent of Neymar’s sporting rights at the time of the move, and were awarded two-fifths of the $18.5 million Barcelona paid to the Vila Belmiro outfit for the star’s signature. However, since then it has been alleged the transfer may well have cost Barcelona as much as $90.4 million. DIS say the smaller figure has been commonly used to avoid paying them a larger amount, with Santos and Neymar’s father, who is also his agent, netting the money instead. 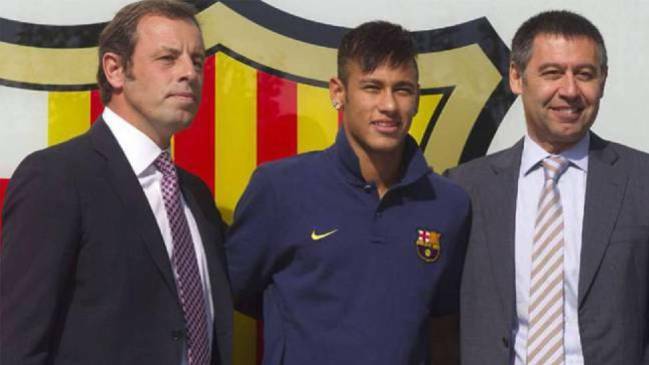 The Spanish press confirm the Brazilian company has taken action against the player, his father, both clubs, Barca president Josep Maria Bartomeu and predecessor Sandro Rosell, and two Santos executives. Spanish prosecutors have reportedly requested that Neymar be charged with fraud and corruption, with the South American to face court if this happens. The latest developments add to the 23-year-old’s off-field woes, with the tax fraud investigation over his transfer to Barcelona still ongoing. Both Bartomeu and Rosell are also embroiled in these legal proceedings. They could face jail time if it is proven they cheated the Spanish authorities over tax due in Neymar’s move to Camp Nou. Former Blaugrana boss Gerardo Martino admitted previously that the off-field controversies had been impacting Neymar’s performances for the Catalan club. The player’s father has said in the past that the ‘tax witch-hunt’ could see the superstar leave Spanish football. Neymar’s global stock is rising to astronomical levels, with Nike confirming he will be the first footballer to have his own custom-made pair of Air Jordan trainers. The Brazilian had a momentous 2015. He played a key role in Barcelona winning five trophies, including the Champions League and La Liga. Neymar has also been included on the three-man shortlist for the Ballon d’Or award, along with club teammate Lionel Messi and Cristiano Ronaldo. The winner will be announced on Monday.